The editor takes in the beaches of Normandy. thanks. I respect what you did. You were brave. You were strong. You did your duty. It’s right that we do this, and right that we keep their memories alive through our models. Off the sprue: What’s your funniest holiday memory? After opening gifts one Christmas morning, my daughter looks at her brother and says, “This is a lot better Christmas than last year!” I asked, “Why?” She volunteers, “Because this year we didn’t know everything we were getting.” I realized that I should start hiding the gifts better! It’s not really funny, but: Every year, my grandmother asked me what I wanted for Christmas, and I sent her a list of kits. I think she took the list to a hobby store and handed it to the clerk. The result was a bunch of models that kept me in the workshop through the rest of the summer holidays. Well, there was that time when I was real young and my sister and I thought someone was breaking into the house on Christmas Eve. Maybe it was Santa, maybe our parents putting presents under the tree … No matter — we still ended up barricading ourselves in my room. One Christmas Eve, Uncle Eddie (always our Santa) came down with a stomach bug during dinner. We improvised, asking a neighbor, who was big enough, but nothing like Eddie! He agreed. But did the suit fit? No. Did the beard fit? No. We had a saggy, poorly stuffed Santa with a weak Ho, Ho, Ho! Shop modeling tools at ols To y b b o /H m o .c re to S y b b o H ch a b lm a K Sales tax where applicable. SPECIAL EMAIL & WEB ADDRESSES Ad Sales adsales@FineScale.com Letters to the Editor editor@FineScale.com New Products mfreitag@FineScale.com Reader Gallery Contribute.Kalmbach.com Reader Questions questions@FineScale.com Reader Tips tips@FineScale.com ©2017, Kalmbach Publishing Co., all rights reserved. This publication may not be reproduced in any form without permission. Printed in the U.S.A. Allow 6 to 8 weeks for new subscriptions and address changes. Subscription rate: single copy $6.99; U.S. 1 year (10 issues), $39.95; 2 years (20 issues), $74.95; 3 years (30 issues), $94.95. Canadian: Add $8.00 postage per year. Canadian price includes GST, payable in U.S. funds. All other international subscriptions: Add $12 postage per year, payable in U.S. funds, drawn on a U.S. bank. BN 12271 3209 RT. Not responsible for unsolicited materials. Settling in for a build After almost two years of settling into our new home, I was finally able to set up a comfortable work space and continue my many projects. (Thanks goes out to my wife, Lisa, and two young daughters, Genevieve and Angeline.) I have plenty of room for just about anything, and all my tools are within easy reach. I also have a special desk to work on. It is a wood bunk from an Oberon-class submarine of the Royal Canadian Navy. As I am originally from Halifax, Nova Scotia, I would often see these submarines passing through the harbor. Once they were decommissioned, they were stripped before being sold. I was fortunate to obtain the bunk, which I flipped over, attached some legs to, and turned into a nice, long work space. (More thanks goes out to my older brother, Richard, for getting the bunk for me). ’Tis the season — for modeling! Hoping for kits this gift-giving time of year? Spending any time off at the workbench? Share photos of your work-in-progress and complete builds (edible or not) with us on Facebook. We all have motivations for building; I have a number, but to get something published in your magazine was near the top of the list. I can’t tell you how good it felt to see it there! So now that I have that out of the way, I guess I can move on to other things. Hmmm… I do have about 500 unbuilt kits in my basement — most of which I want/ intend to build. Get ready for more submissions! – Joseph Cournoyer Albany, Ga.
One down, 500 to go I wanted to thank you folks very much for putting my SAS Land Rover in the September Reader Gallery. – Bill Horton West Hartford, Conn.
On the twice-monthly New Product Rundown (NPRD), anything goes! While Aaron Skinner and Elizabeth Nash usually review new scale models, bouts of slam poetry are liable to break out. Stay tuned to see what happens next. Visit our website to order on-line. All Credit Cards and PayPal accepted. Sales Tax added to CA orders Follow us on Facebook! shame, but there’s nobody to blame but ourselves … and the convenience of online ordering. – James Stangroom Star Junction, Pa.
then reading in FineScale what you should’ve done. With new skills, your model won’t resemble a toy. You’ll find it’s the craftsmanship you most enjoy! The result can be a masterpiece of the modeler’s art, and this all could be yours, if only you’d start! – Ken Murphy University Place, Wash. Ed. : Are you a poet/modeler? We want to hear your verse! Email poetry@FineScale. com with your free verse, sonnet, limerick, or haiku, and it may be featured on NPRD. Constitution — I did not think she would attack the Cutty Sark! Meltdown: I turned around to get something. When I turned back, Little Miss Bebe had assaulted the model! Half the Cutty Sark’s deck was in ruins. All I could do was cry. Lesson learned: Keep Bebe and the other cats out of my room while working. And when the models are not being worked on, they are now under glass. – Charles Myrick Buchanan, Ga. In the December 1991 issue, Greg Kerry superdetailed scale motorcycles and, incidentally, inspired Lee Mitcheltree to strive for more when building. to 1993 on my bookshelf. The first issue I ever saw was pre-internet; some guy did an awesome detail job on a Tamiya 1/12 scale Suzuki RG500 Grand Prix bike. That article (in the December 1991 issue) completely opened my eyes and made me see that there was so much more I could do to create a scale replica. Your passion, efforts, assistance, tutorials, and generosity with sharing tips and techniques has undeniably helped me increase my skills — to the point where I am building exclusively for contract and spending my spare time creating masters, making molds, and casting them in resin. I greatly value what you do for all of us, and am grateful I discovered your magazine. – Lee Mitcheltree Everett, Wash. Correction In the October 2017 Reader Gallery, Paul Meier’s uncle is John W. Haun. *Free Shipping offer applies to standard shipping to the 48 contiguous United States ONLY. Cannot be combined with any other offer. Offer is guaranteed through 12/31/17. part louvers, marks the engine deck. But the real highlight is the fighting compartment with a driverâ&#x20AC;&#x2122;s position, racks of ammo, weld seams outside, and the rear-facing 17-pounder with breech, controls, and a one-piece barrel. Three figures finish the scene. Decals provide markings for two Archers in early 1945, one in Canadian service in early 1945, the other with the Polish II Corps in Italy. Bf 109G-4 from Eduard, No. 82117, $39.96. ProfiPack Edition. AH-64D Longbow Apache from Italeri, No. 2748, $39.99. Upgraded molds. Includes 5 marking options: American, British, Japanese, Dutch, and United Arab Emirates. T-28C Trojan from Kitty Hawk, No. KH32015, $80. Look for a detailed review in an upcoming issue of FSM. Bf 110F from Eduard, No. 8207, $59.96. ProfiPack Edition. MiG-15UTI Finnish Air Force from Platz, No. AE-4, $27. Eduard plastic and Cartograf decals. Su-27SM2/3 Flanker B Updated Roland C.II from Eduard, No. 8043, $27.96. from Platz, No. AE-5, $55. Zvevda plastic and Cartograf decals. Hunter F.6/FGA.9 from Italeri, No. 2772, $44.99. Includes markings for five aerobatic or airshow performance aircraft. Fokker Dr.I from Eduard, No. 8162, $31.96. T-2 late type JASDF Advanced supersonic trainer from Platz, No. AC-21:2800, $27. Typhoon K from Takom, No. 2082, $55. Look for a detailed review in an upcoming issue of FSM. Kettenkrad from Italeri, No. 7404, $99.99. EF-2000 Typhoon from Italeri, No. 72001, $31.99. Starter kit: acrylic paints, brush, liquid cement, sprue cutter and online video tutorial. No. 402013010, $27. Designed for Bolt Action World War II wargame. Mirror Models, No. 35166, $64.95. Italeri, No. 1392, $22.99. Cartograf decals for 2 aircraft. No. 402011003, $32. Designed for Bolt Action World War II wargame. .
No. 402012018, $29. Designed for Bolt Action World War II wargame. No. FC-6, $24. Flying Color Selection. Contains 2 kits. Look for a detailed review in an upcoming issue of FSM. able turn screw, clamp the model in place. Then the clamp, which is wrapped in leather, becomes a handle that fits comfortably in your hand and is easily turned to reach all sides of the figure. A slotted stand supports the idle handle at two angles. Warlord Games, No. 402416004, $35. Designed for Bolt Action World War II wargame. from Warlord Games, No. 402011009, $21.67. Bolt Action. Doctor Who Exterminate! from Warlord Games, No. 602010101, $20.83. Davros & The New Dalek Empire expansion set. Time Vortex. C3 Strike Squads & Support Drones from Warlord Games, No. WGA-CON-16, $32. Beyond the Gates of Antares. On the Great Plains Indian Family with horse and accessories from Master Box Ltd., No. 35189, $19.95. Doctor Who from Warlord Games, No. 602210010, $32. Tenth Doctor & Companions. For Time Vortex miniatures game. Australian Jungle Division Infantry Section from Warlord Games, No. 402215001, $24.95. 10 metal 28mm WWII miniatures. Fujitsu Ten Tom’s Corolla AE101 from Italeri, No. 20302, $52.99. 1/25 SCALE Hail Caesar — Macedonian Successors War Elephant from Warlord Games, No. 102614002, $32. Metal and resin Macedonain Successor elephant with five crew. No. AMT1058/12, $31.95. Special Release Original Art Series. Includes print suitable for framing. ’64 Ford Fairlane Thunderbolt from Revell, No. 85-4408, $22.95. from Barracudacast, No. BR24325, $12.95. from Revell, No. 85-4218, $26.95. 1/32 SCALE ’92 Mazda Miata MX-5 from Revell, No. 85-4432, $22.95. Mercedes AMG GT3 from Tamiya, No. 24345, $66. Spitfire four slot mainwheels from Barracudacast, No. BR32335, $8.95. Sopwith Camel wicker seat with cushion from Barracudacast, No. BR32332, $6.50. ’83 Camaro Z28 from AMT, No. AMT1051/12, $29.95. Spitfire 4 slot block tread mainwheels from Barracudacast, No. BR32319, $8.95. Spitfire 4 slot mainwheels from Barracudacast, No. BR48317, $7.50. Spitfire 4 slot block tread mainwheels from Barracudacast, No. BR48318, $6.95. Welcome new manufacturers Lamborghini Miura from Italeri, No. 72002, $37.99. Starter kit: Contains paints, brush, liquid cement, sprue cutter, and online video tutorial. Eduard, No. 648 324, $12.95. MiG-15 UTI exterior from Platz, No. M-72-40. Contact your local dealer for price information. Spitfire Mk.VIII top cowl for Eduard from Eduard, No. 648 338, $4.95. Walrus Mk.I wheels from Eduard, No. 648 343, $9.95. from Werner's Wings, No. WW48-14, $16. UH-1D/H stencils from Werner's Wings, No. WW48-15, $10. MiG-15 UTI landing flaps from Platz, No. M-72-41. Contact your local dealer for price information. Walrus Mk.I flexible mask for Airfix from Eduard, No. EX557, $12.95. from Hannants/ Xtradecal, No. X72274, $10.57. Nationalist fighter & ground-attack collection. from Hannants/ Xtradecal, No. X72275, $10.57. Nationalist fighter & ground-attack collection. Valentine Mk.II/IV canister holder for Tamiya from Eduard, No. 36361, $19.95. Valentine Mk.II/IV for Tamiya from Eduard, No. 36359, $34.95. MiG-15 UTI interior from Platz, No. M-72-39. Contact your local dealer for price information. from Hannants/ Xtradecal, No. X72277, $10.57. Also available in 1/48 X48181. Vought F-8 Crusader Development of the Navy's First Supersonic jet fighter No. SP242S, $44.95, by William D. Spidle, hardcover, 228 pages, 105 color photos, 326 B&W blackand-white photos, ISBN: 978-1-5800725-8-8. From Specialty Press. Objective Saint-Lô 7 June 1944 18 July 1944, US Navy Squadron Histories - No. 302 From Bats to Rangers, $69.95, by Ginter Books, softcover, 240 pages, 661 photos and illustrations black-and-white photos, ISBN: 978-09968258-9-4. From Specialty Press. $39.95, by Geroges Bernage, hardcover, 256 pages, all blackand-white photos, ISBN: 978-1-47385760-5. From Pen & Sword Books Limited. of the Division on the Western and Eastern Fronts Images of War - $22.95, by Ian Baxter, softcover, 144 pages, all black-andwhite photos, ISBN: 978-1-47389089-3. From Pen & Sword Books Limited. by Tom Gannon, hardcover, 406 pages, 375 black-and-white photos, ISBN: 978-184768-023-5. From Barbarossa Books. Yom Kippur — No Peace, No War, October 1973, $22.95, by Peter Baxter, softcover, 128 pages, all black-andwhite photos, ISBN: 978-1-52670790-1. From Pen & Sword Books Limited. AV-8B Model — How to build Hasegawa's AV-8B II Plus model, $35.99, by Glenn Hoover, softcover, 187 pages, all color photos, ISBN: 978-1-54807005-2. From Glenn Hoover Plastic Model Builds LLC. Malayan Emergency — Triumph of the Running Dogs 1948-1960, $22.95, by Gerry Van Tonder, softcover, 128 pages, all B&W photos, ISBN: 978-1-52670786-4. From Pen & Sword Books Limited. Canopy: To show the detailed resin cockpit, Kelly slowly and carefully cut the one-piece canopy apart with a UMM-USA fine razor saw and posed the hatches open. FOD covers: To make intake covers, Kelly stuffed packing foam into the openings and covered them with tissue soaked in white glue. Red paint and decals finished the job. Nicknamed Aardvark early in its career, the F-111 was not officially given that title until its USAF retirement in 1996. Markings: Kelly used an Afterburner Decals set to mark the model as an Aardvark of the 494th Fighter Squadron, based at RAF Lakenheath in 1992. This aircraft flew 56 combat sorties during Operation Desert Storm in 1991 and took part in Operation El Dorado Canyon, the 1986 strike against Libya. Washes: Kelly sealed the decals between layers of Pledge FloorCare Multi-Surface Finish, then applied a wash of dark brown artist’s oils to the entire model. He let the wash dry, then wiped the F-111 with lint-free rags, always finishing by dragging the cloth in the direction of airflow. An old, wide paintbrush reached tight spots to blend everything. “For vents or deep recesses, I use black oils,” he says. retired as Region 5 coordinator. When not at the bench, he runs his foodpackaging business with his wife of 22 years, son, sister, nephew, brother-inlaw, and many other employees. Pastels: Over a layer of Testors Dullcote, Kelly applied powdered pastels to areas in need of extra dirt and grime. Metallics: Kelly base-coated the metal areas around the exhausts with Testors Model Master jet exhaust. Then, airbrushing freehand, he applied various metallic shades followed by a dusting of Tamiya clear blue, clear purple, and clear orange. The key is to be subtle with the transparent colors, he says. f you are modeling soldiers from just about any era, youâ&#x20AC;&#x2122;ll need to paint guns â&#x20AC;&#x201D; that means everything from rifles to pistols to submachine guns. Some have wooden stocks, others may include pressed metal, and all will have machined parts. To demonstrate some of my favorite techniques, I painted German World War II weapons from several Dragon 1/35 scale figure sets. These are some of the nicest plastic guns available. I used handmade brushes from The Brushman, David Jackson (thebrushman@hotmail.co.uk). Use one brush for metallic paints and another for other colors. In 1/35 scale, these things are small and kind of awkward to hold onto during painting. I stuck them in blobs of Blu-Tack poster putty on a cork handle. Next Issue What better way to follow a description of painting guns than with the hands that hold them. Joe shows you how in January. 1 Over an airbrushed layer of Vallejo gray primer, I brushed Vallejo gloss black primer on the metal areas of an MP40. I kept the black thin because the weapons are small and have fine detail that thick paint would obscure. 4 This is not dry-brushing; I am making conscious decisions about color placement. This gives me control over the final appearance and prevents detail from being covered. 7 To base-coat the pistol grip, I mixed flat black and Panzer Aces light rubber. After washing it with the thin black ink to darken recesses, I painted raised features with pure light rubber. 2 Two Bakelite panels sit on either side of MP40s. I painted each with several layers of thin Vallejo flat earth. This wonâ&#x20AC;&#x2122;t be the final color, but blocking them in now helps me paint them later. 5 To reinforce the highlights, I mixed Vallejo oily steel and gun metal gray and applied it to ridges and upper surfaces. The areas that would receive the most light were painted with almost pure oily steel. 8 I touched up the Bakelite panels with flat earth, then dabbed on a little Japan uniform for tonal variety. 3 Then I brushed thin Vallejo Metal Color gun metal gray over the barrel, magazine, and receiver. Using thin layers, I gradually increased the density. 6 After brushing flat black into shadows and areas that could be separated from one another, I applied an overall thin glaze of Andrea black ink; be careful, and donâ&#x20AC;&#x2122;t use it undiluted. I painted the metal on the Kar 98K like the MP40, but over flat black, rather than gloss, for a slightly different appearance. Then I basecoated the wood with Japan uniform WWII. Using a fine brush, I painted thin, random lines of Vallejo chocolate brown along the gunâ&#x20AC;&#x2122;s stock. I repeated that process with flat black, but applied fewer lines. Then I applied lines of Vallejo deck tan. In addition to wood grain, this color also served as a highlight shade. So, I brushed it onto upper areas of the stock. Several thin coats of Vallejo wood grain blended the underlying stripes and produced a varnished appearance. I brushed Vallejo orange brown onto a few spots and stripes, then applied a final glaze of wood grain. Outlining the metal areas with flat black finished the rifle. For a different look on the Gewehr 43 stock , I applied a base coat of mahogany brown darkened with a touch of flat black. I finished the metal components like the other guns. Instead of long streaks, I brushed short tick marks of flat black over the mahogany brown. Lighter tick marks followed as I applied a mix of orange brown and Japan uniform. espite its reputation as a “hot ship” that required constant attention and earned nicknames like “Widow Maker” and “Martin Murderer,” the B-26 served admirably through World War II. Operated by U.S. 9th Air Force squadrons based in the United Kingdom, the medium bomber was known for bombing accuracy. Wonderfully molded, Hasegawa’s 1/72 scale Marauder shows all the characteristics of a modern kit: fine, recessed panel lines mark external surfaces, there’s good detail inside, and the canopy and other window parts are crystal clear. But that doesn’t mean it can’t be improved. I enhanced the details, then painted it with well-worn camouflage befitting a veteran bomber in the Mediterranean. Cockpit The cockpit subassembly incorporates the bombardier’s compartment. A decent level of detail highlights the instrument panel and center console. The instrument panel’s recessed gauges and dials, bezels, and the throttle quadrant and levers are all crisply molded, 1. I dressed up the pilot seats with photoetched belts from an old Eduard set. 1 I carefully picked out details on the instrument panel’s recessed dials and the throttle quadrant’s levers. The moldings are terrific, but much of it will be nearly invisible once the fuselage is closed. 3 Stretching wire across the structural members gives the well-molded detail in the wheel bay even more of a 3-D effect. 2 Brown artist’s oil washes highlighted details and added a touch of grime to the cockpit. 4 Mimicking the unpainted bays of the B-26, I painted the parts a metallic shade. 6 Aft of the bomb bay, the aircraft features the base for the dorsal turret, frames for the low waist positions, and the tail gunner’s seat. There’s no detail in the radio room, but there are windows. I covered the fishing sinkers with sheet styrene painted interior green to hide the ballast from prying eyes. I drilled holes into the ignition ring and inserted copper wire. The other ends go to holes drilled in the cylinders. Detail painting, dark washes, and dry-brushing brought out the engine’s crisply molded cooling fins and push rods. Adding rivets to the wings before gluing the halves made the job a snap; the parts lay flat on my workbench, providing a steady surface. The nose-wheel bay is molded under the cockpit floor. I detailed it with copper wire for hydraulic lines and strips of masking tape for brackets, 3. I painted it and the components for the main landing gear bays in the engine nacelles Alclad II white aluminum (ALC-106), 4. I assembled the undercarriage, then detailed it with wire hydraulics, 5. I installed the cockpit, bomb bay, and rear crew positions in the starboard fuselage half, 6. Before adding the port half, I filled the radio/navigation room aft of the cockpit with sinkers as ballast, 7. The canopy didn’t quite fit and revealed a small gap at the top; careful sanding and filling eliminated the problem. The wings and stabilizers went together without problems. The three-part horizontal tail plane was molded in clear plastic to account for small windows under the rudder. Putty and sanding eliminated seams and minor sink marks; sheet styrene replaced a raised panel aft of the cockpit that straddles the centerline. Hasegawa did a nice job on the Pratt & Whitney R-2800 radials, but I wired the ignition system, 8, then carefully painted the power plants, 9. Bomb bay I planned to pose the doors open. Detail molded onto the bomb bay’s bulkheads and roof pops with washes over airbrushed interior green. The roof incorporates large locating tabs for the wings that set dihedral. I left the racks and four 1,000-pound bombs and fragile door actuators off for painting. Hasegawa provides a separate part to close the bay that’s perfect for masking the bay during painting. Sources B-26 Marauder gun barrels, Quickboost (No. QB 72088), www.quickboost.net. Available from www.spruebrothers.com. The assembled fuselage didn’t stand up to riveting pressure as well as the wings, forcing me to repair seams a couple of times. With masks on the windows, landing lights, nose, tail, turret opening, and engine cowls, the airframe sits ready to be painted. I painted the canopy frames interior green to match the cockpit. The keys to filters are varying the density of the colors and ensuring each layer is dry before adding the next. I used four colors brushed on during several sessions over several days. There’s no strict guideline as to when the job is done. I think I’m done when all of the gloss is gone and the finish is flat. After brushing dark artist’s oils over the panel lines under the plane and letting them dry, I wiped away the excess. A coat of acrylic clear flat sealed the deal and blended the camouflage, decals, and weathering. In addition to small parts like landing gear and props, I chipped the paint with dabs of silver applied with a fine brush. Riveting surfaces Before adding the nacelles to the wings, I decided to enhance the surface with rivets. Referring to drawings, I penciled lines of rivets on the plastic and rolled a ponce wheel along them, 10. The relatively flat wings were easily marked, but the curved fuselage proved challenging. I needed to apply enough pressure to mark the plastic, but using too much deformed parts and cracked seams. I repaired more than one such fissure. The added realism made the effort worthwhile, 11. The engine nacelles fit the wings perfectly. The wings match the roots, but I left them off for basic painting so I could better reach awkward areas between the fuselage and nacelles, 12. Painting and decaling After pre-shading panel lines and rivets under the wings, tail planes, and fuselage with dark gray and dark brown, I airbrushed the undersides with LifeColor neutral gray (UA046). I masked the wavy demarcation line between the colors and applied LifeColor olive drab (UA005) to upper surfaces. More masking followed so I could spray the front of each cowl Tamiya red (X-7). Several coats of Tamiya clear (X-22) prepared the Marauder for decals. Using the kit sheet, I marked the aircraft as Miss Manchester with the 441st Bombing Squadron, Italy, 1944. A little decal solution settled the decals into panel lines. I sealed the decals with another coat of clear gloss. fer between aircraft, so it’s best to work from photos, 14. Before applying filters, I wet the area with clean white spirit. This helps the color flow better. If I’m unhappy with the result, I immediately apply clean white spirit to remove the color. A note of caution: Oil washes and white spirit can only be applied over acrylic paints; they will attack enamels. Under the plane, I applied the customary dark artist’s oil wash along panel lines, 15. Dry-brushing accentuated details, and simulated fluid stains on the nacelles and fuselage. After blending the finish with a coat of GSI Creos Aqueous Hobby Color clear flat, 16, I applied dots of silver paint along leading edges and panel lines to show chipped paint. Modeling a U.S. Marines tank in the Pacific offers opportunities for different dioramas, color schemes, and interesting field fits — all of it heavily weathered by sun, salt air, and savage combat. 1 Scratchbuilt wading trunks: I had an old set by Italeri, but so thick it looked like it was made from armor plates. Instead, I used the Italeri parts as patterns and built mine from .010-inch sheet styrene. 2 I spent more time researching and figuring out the trunks than actually building them. I reinforced seams with styrene strip and smoothed out the assembly with Squadron green putty. 4 For the turret, I dug out some leftover Panda T-54E1 tracks, cut off the treaded cleats, and transferred them to the kit’s DS tracks — thus avoiding having to dig up a new set of tracks for such a short run. 6 After completing basic construction, I prepped the entire vehicle by airbrushing with Vallejo Model Air gray primer. 8 … followed by selectively airbrushed Vallejo white for highlights to mimic the play of light on the tank and its features. 3 Wood planks and spare track add armor: Planks were offset to counter “lunge” mines held at the end of a 5-foot pole — essentially a pass-orfail test for the attacker. Basswood planks are mounted on styrene strips. 5 Sandbags made from Magic-Sculpt two-part putty: Roll out a 3⁄8-inch thick rope, cut to length, then shape and place. Closures are smaller rolls. Talcum powder and a wet brush make it easier to manipulate. 9 I began the camouflage with a base coat Tamiya olive green, and used a thin coat of Tamiya sky for highlights. I placed rolls of Blu-Tack to mask as I began painting the tricolor camouflage. The second color was a mixture of Tamiya NATO red brown and Tamiya deck tan. The third color was Tamiya khaki highlighted with a 1:1 mix of khaki and Tamiya buff. I painted the sandbags with the latter, lightening and darkening the mix to vary the look. I applied paint chips with a 20/0 brush using Vallejo green gray, oversprayed with Pledge FloorCare Multi-Surface Finish, then detailed the chips with Vallejo black brown. Corrugated tin roofing (scale version available from K & S Engineering) provided an extra layer of protection to the planks. It was often cut with serrated edges to discourage hitchhikers. … with a flat brush, blended the colors with a series of downward strokes and a bit of paint thinner. The filters lend depth and contrast to various surfaces, emphasizing details as they add subtle tints. … followed by washes of light rust and brown 502 Abteilung oils. … to replicate sun-bleached rusty metal. Since these tanks were weathered by amphibious operations and salt air, I worked to show active corrosion. Next, the pigments: I applied a combination of Mig Productions dark mud, dry mud, and industrial city dirt in a wash, let it dry, then pulled off excess with a brush dampened with thinner, repeating as necessary. For the base, the foundation of groundwork is insulation foam, easy to shave and shape. This is the beginning of the tank’s final pose. I mixed up a base coating of plaster, then added texture with broken plaster, cast in slabs and smashed to resemble stone and concrete, mixed with multiple grades of railroad-scenery talus. I base-coated the groundwork with Tamiya NATO black, followed with a coat of buff, then worked in various pigments. I made a tarp from Magic-Sculpt rolled out thin and sculpted with a wet paintbrush. In mid-June, Squadron hosted EagleQuest, its annual get-together and modeling contest in Grapevine, Texas. Feeling more like a friendly reunion than a modeling contest, the show attracts hundreds of modelers for two days of seminars, warehouse shopping, evening socializing and frivolity, and the peer-judged competition. FSM’s Aaron Skinner hit the road and snapped these photos. For more EagleQuest models, pick up Great Scale Modeling 2017. Order your copy today at KalmbachHobbyStore.com. CARROLLTON, TEXAS Taking an online challenge posed by Flory Models, Robert built Hasegawa’s 1/48 scale F6F-5 Hellcat in a weekend. The only changes he made to the kit were the addition of Eduard photoetched seat belts and applying aftermarket decals over Vallejo acrylics. PLANO, TEXAS In 1917, the U.S. Navy tested the unique Gallaudet D-1, featuring a mid-mounted propeller spun by a pair of Duesenberg engines. Only one of the seaplanes was built, but that didn’t stop Kendall from scratchbuilding it in 1/48 scale using styrene and a variety of photo-etched parts for cars and aircraft. He painted the model with Humbrol and Testors Model Master enamels over Tamiya primer. SHOW GALLERY ◀ GERMAN CANDIA JR.
MEMPHIS, TENNESSEE German painted Games Workshop’s 1/72 scale dreadlord on a dragon with Citadel acrylics over white primer. Acrylic washes emphasized details. CEDAR HILL, TEXAS Donald did a straight-from-thebox build of TV’s famous straight shooter, Lucas McCain, played by Chuck Connors in The Rifleman. After spraying Glory Guys’ 1/8 scale Cowboy with Trick Rifle with Tamiya primer, Donald basecoated major colors with Vallejo acrylics and hand-painted artist’s oils and acrylics for shading and details. In the music video Dreams, the gravity-defying Blues soar to the music of Van Halen (whose hair was also gravity-defying). Rewatching his childhood favorite for research, Darren was inspired to build an accurate Super Foxtrot. Wanting my own Blue Angels aircraft, I started with Hasegawa’s 1/48 scale A-4E/F. The Blues didn’t fly a standard F model, though; they flew a Super Foxtrot, which had an upgraded, more-powerful engine. They also modified their A-4s to performance standards. The quilted padding is nothing more than crosshatching done with a hobby knife on two-part epoxy putty. To re-pose the horizontal stabilizers, I cut away the molded sliding plates to make way for resin replacements. The stabilizers fit into the resin sliding plates easily. Care was taken to ensure proper alignment. Kit parts A3 and A4 blocked off the chaff and flare dispensers, which the Blue Angels don’t carry. Parts from a resin set enlarged the engine intakes on each side of the fuselage. The angled pipe injects paraffin directly into the exhaust, which is then dispensed in the form of colorful smoke under the “sugar scoop,” seen here on the finished model. weights added to the nose ensured the model stood on its front gear. I installed the antenna on the spine behind the canopy. Because Blue Angel Skyhawks didn’t have chaff or flare dispensers, I blanked off those recesses with kit fuselage plugs with no molded-in buckets, 5. I attached the brake-parachute housing and the smoke oil pipe to the so-called “sugar scoop” above the exhaust, 6. This pipe is aimed diagonally and generates the smoke seen during the routines. To save weight, the Blues left off all of the electronic countermeasure (ECM) antennas, so I did as well. Because the leading-edge slats are wired shut on Blue Angels A-4Fs, I removed the rails at the front. To finish the conversion, I sliced and sanded away the slat wing fences. Be sure to leave the fence molded inboard of the slat bay. I used the kit-supplied insert for the starboard wing root, but replaced the port insert with a resin ladder container. Blue Angels Skyhawks were always fitted with the centerline pylon, even during shows, so I added it the belly. edge, 9. The third barricade fence on the leading edge of the wing, just inboard of the slat, should remain in place. The centerline pylon was then installed, 10. On the starboard side, I added the wing root, which doesn’t contain an opening for the cannon, and a resin boarding-ladder container on the port side, 11. I sanded down the back of the incorrect recessed bay, being careful to not disturb the vortex generators molded onto the wing. Creating this finish required lot of prep work, making sure each layer of color was sanded perfectly. I mixed two shades of blue to achieve the iconic hue. Once the decals were on, I skipped the final coat of clear. All of the polished metal areas, such as the slats, exhaust, intake lips, and leading edges of the tail and horizontal stabilizers, were sprayed with Testors Model Master enamel gloss black. I let that dry for a good five days, then sprayed Alclad II polished aluminum, which I masked off when it had dried. Next came the blue. Model Master has a color called Blue Angel blue, but it’s too dark. A touch of intermediate blue lightened it just enough. This mix was lightly misted over the entire model in four thin coats, preventing any orange peel effect. I let that dry five days as well. Videos and more photos Search for Star Wars on FineScale.com to see hundreds more models from the movies. ooking for a simple yet fun project, I turned to Bandaiâ&#x20AC;&#x2122;s 1/12 scale BB-8 droid (No. 032205), first seen in Star Wars: The Force Awakens. This kit also includes the iconic R2-D2, which I saved for later. While I chose to repaint and weather the droid, these steps could easily be skipped as the parts are already brightly colored. 1 Clever engineering from Bandai allows parts to be painted on the sprues without hindering fit. The only section that required gap-filling super glue was the head, which comes in halves. The orange band near the top needed extra sanding to fit perfectly. 2 A base coat of Mr. Surfacer 1500 black primer covered the orange, silver, and white plastic. 3 Aiming for a worn and weathered look, I lightly sprayed Mr. Base White 1000 over the black. Varying its density allows the dark color to filter through, playing up the appearance of a well-used droid. Alclad II duraluminum went over the silver components. 4 Strangely, my custom orange blend, which looked identical to the sprue in the container, became too yellow once applied. Iâ&#x20AC;&#x2122;d remedy this later. 5 Once BB-8 was thoroughly colorful, I assembled the six body rings. This was a no-fuss process as the parts simply clicked together onto a central chassis via keyed mounts. 7 Time to fix the supposed-to-be-orange color. An OLFA rotary circle cutter was indispensable in making circular masks. 8 I sprayed Tamiya clear orange over the yellow. Now, BB-8 was beginning to look like itself. Once the orange was dry, the white body panels were applied. Bandai supplied a number of small markings in decal and sticker form. A layer of Tamiya clear mixed with Mr. Color Thinner came next. The kit provides BB-8’s lighter “thumb” as an optional detail that I elected to deploy. The mechanism, door interior, and cavity were painted Alclad II steel. No flame was provided, so I carved one from clear sprue and painted the tip Tamiya clear blue. The large and small eyes of the droid are heavily-tinted transparent plastic. After masking the lenses, I airbrushed dark gray on the frames. I initially installed the kit’s antennas. However, the silver-and-black one was over-scale, so I fashioned a new one from stretched sprue. BEDFORD, INDIANA Having bagged Italeri’s 1/35 scale kit, Brian cooked up his DUKW with all the trimmings: Eduard photo-etch, scratchbuilt spotlight, twisted wire to replace the winch cable, solder tie-downs, and a scratchbuilt engine and engine compartment with spare PE added. He painted with Vallejo colors, artist’s oil filters and washes, and Mig pigments. The barrels are from a Tamiya vehicle accessories set. WERDER (HAVEL), BRANDENBURG, GERMANY Erik built Bandai’s 1/12 scale Sandtrooper and armed it with lethal jelly beans that it carries in a kit-bashed backpack. He painted his “Jelly Trooper” with “UV neon colors” and displayed it on a base made from wood, sand, plaster of paris, and oven-hardening Fimo. SEATTLE, WASHINGTON Bumping up his Bradley, Nathan added masking-tape bag straps and stretched-sprue antennas to Tamiya’s 1/35 scale M2A2. By the time he finished with Testors Model Master acrylic paint, Mig washes, and Tamiya weathering powders, he had spent 80 hours on the build. FORT WAYNE, INDIANA Paying an imaginative tribute to the online video game World of Tanks in three dimensions and 1/35 scale, Dave pitted Meng’s FT-17 against Parc Models’ MS-1. For the base, he pulled ruins out of his spares box and added plaster work, balsa-wood flooring and doors (with hinges), piles of rubble, and sheet-styrene sidewalks and street. PARRY SOUND, ONTARIO, CANADA “This is the old, very old Airfix 54mm British Hussar,” Wes says. He painted it with Humbrol enamels and used BareMetal Foil on the saber. NORTH OAKS, MINNESOTA Going bigger than his usual 1/350 scale ships, Chuck devoted 2,434 hours to building Trumpeter’s 1/200 scale USS Arizona, depicted on August 11, 1941, in Measure 1 camouflage. He added more than 850 scratchbuilt details and photo-etched pieces, right down to opening the cockpit on one of the Kingfishers on its catapult. ”It’s historically accurate and looks pretty nice, too,” he says. Tamiya’s 1/35 scale 8.8cm gun is surrounded by stonework that’s easy to sculpt and gives the model context. The base is my usual: a plastic photo frame with a Styrofoam base. I also used Styrofoam as the base for the stone walls. Covering the foam with Magic-Sculpt starts the stonework. I work in small sections so the epoxy putty doesn’t dry before I can work it. … scribe with a dental pick. … and before long, what was putty looks like masonry. … as well as a casualty left behind. Airbrushing light gray provided highlights. I immediately brushed the turned-metal shells with thinner so the gray paint came right off. Painting with pastels: I sand them to powder and use odorless turpentine to make them lighter (thinner) or darker (more dense). I looked up Italian stonework and chose some photos to reference. I added some of these colors to the rubble, too. 9 Another airbrush pass with very thin armor yellow added contrast. explained how I badly wanted to see one in action. My request was granted and I visited the USCG air stations in San Francisco and San Diego, where an HH-60J resided. There, I took all the reference photos a modeler could want. Back at the workbench, I began construction on the 1/72 scale Sikorsky SH-60B Seahawk from Italeri. A conversion set from Fireball Modelworks (No. FMR-002) provided resin upgrades and a complete decal sheet. 2 Starting with the bottom of the cabin, I drilled out the molded tiedowns and replaced them with copper wire bent to shape. 3 Here is the copper-foil rescue basket. Next came fire extinguishers made of plastic rod and metal foil, and two movable observer chairs on rails made of styrene sheet and strips, plus foam for the cushions. 5 Using a Waldron punch-and-die set, I perforated a plastic card, detailing the instrument panel with the small cutouts. Replacing unconvincing pedals with scratchbuilt ones increased their realism. 7 With the interior filled and painted, I joined the fuselage halves. This required a lot of sanding, complicated by the missing doors and windows. Hence, tons of dust ended up where it shouldnâ&#x20AC;&#x2122;t have been. 4 Gear, bags, tools, fire extinguishers, a rescue basket, plus two pilots are crammed into the not-so-generous space. I used a lot of lead foil, crafting life vests, small pockets on the survival vests, and seat belts. 6 I removed the hollow sonobuoy pylon and radar warning receiver by filling them with resin from the inside and sanding them to shape from the outside. The APU exhaust is aluminum tubing. 9 After smoothing the surface with finishing cloths from Albion Alloys, I rescribed the airframe using strips of tape as a guide. New rivets were added with ponce wheels of different diameters. 10 The prominent radar nose of the Jayhawk was attached. Next came the pylons for the external fuel tanks — these are asymmetrical to leave the starboard door and hoist unobstructed. 11 The blades of the main and rear rotor heads were cut apart, reshaped, and thinned. Add-ons include copper wire, steel rod, insulation plastic from thin copper cable, and metal tubes from Albion Alloys. 12 This paint job demanded a lot of masking. After applying a gray base coat, I painted the nose flat black. Once it was dry, I masked off the nose and painted the rest Humbrol satin white. Then came the orange. This vibrant hue is known as international orange. I found an acrylic from Schmincke’s Aero Color line that was just the exact shade needed, called “orange red” (28 320). The Fireball decals are perfect in color and print, but they are vulnerable to smearing. The colors will rub off on your fingers if not fixed with a coat of varnish. After applying that, the decals went on smoothly. I removed the molded-on position and anticollision lights and replaced them with colored and clear glass parts framed with metal foil. The pivots in the windshield and glass parts on the nose were drilled and fitted with metal tubes. I scratchbuilt the wipers and washers as well as the rearview mirrors, which are unique to Jayhawks. The hardest antenna to scratchbuild stretched along the starboard side of the tail boom. I made it from tiny pieces of insulation plastic, aluminum foil, copper wire, and Lycra fiber. The blade antennas were cut from metal foil. I used very thin copper wire for the lightning deflectors on the tail wing. ’d rather spend my modeling money on aftermarket parts and photo-etch than masking sets. Using simple steps and basic tools, I make masks that fit hard-to-cover nooks and crannies, like those on the three canopies pictured. Before I begin cutting, I coat all clear parts in Pledge FloorCare Multi-Surface Finish to protect the surface and create a barrier against super glue fumes. With these masking tricks, rounded edges and tight corners are no longer to be feared. 2 Sometimes I’m able to precisely fit one triangle into a corner (right), and other times I place two triangles side by side with their points together. To show this contrast, I used both Tamiya and blue painter’s tape. 3 After masking the corners, I fill the clear area using little bits of tape. The tape should overlap to ensure a tight mask. 5 After removing the center, I add several relief cuts along the mask to make the tape stretch and conform to the round edge. 7 These small masks protect the rounded corners. 4 For edges that require irregular shapes, like circles over a compound surface, I use a circular cutter, pictured, or French-curve template. 6 When Iâ&#x20AC;&#x2122;m working on a pane with rounded corners, I use a punch to press out tiny circles of tape. Most dentist’s offices give patients a goingaway kit with floss, a small tube of toothpaste, and a toothbrush. Often, these brushes are molded in single color of plastic, such as blue, green, red, amber, and clear. If you’re nice, the dental hygienist might let you choose the color you want — then you’ll have a ready-made supply of scratchbuilding material. The colorful plastic can be made into aircraft running lights, taillights, and much more. – Bill Hardie Jacksonville, Fla.
Don’t throw away champagne corks; they have many modeling uses: If you chop off the mushroom, it can be used as a stand for holding toothpicks or pins which can support small parts — such as wheels — for painting. The wire cage that held the cork in place can be used as a painting jig for metal cables or chains. After unraveling it, bend it into a bow with hooks at the ends. Slip the chain or cable over the hooks. The wire retains a degree of spring so that as it straightens out, the chain or cord is held taut for painting. – Gabriele Geroldi San Donato Milanese, Milan, Italy HAVE A TIP OR TECHNIQUE TO SHARE? 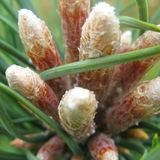 Send a brief description along with a photo to tips@finescale.com or visit FineScale. com and click on “Contact Us.” Tips are paid for upon publication; if you live in the U.S., we’ll need your Social Security number to pay you. FSM obtains all publication rights (including electronic rights) to the text and images upon payment. If you are tired of counting to 100 while you wait for super glue to secure a photo-etched part to your model, try using J-B Weld epoxy resin as an alternative. This product is extremely easy to mix, is workable for an extended period of time, and has the viscosity to hold delicate PE parts like ship ladders in place until the cure is strong enough to fend off gravity. J-B Weld, found in hardware and automotive stores, comes in two versions: one sets in 6 minutes, the other takes 4-6 hours to cure. I prefer the latter because it makes alignment of PE parts less frenetic. Because the epoxy continues to gently flow after you attach the PE part, the end result looks more natural than with other products. It also has a high forgiveness quotient — if you don’t like something, simply wipe it off and try again. I typically dab a small amount of J-B Weld on a piece of cardboard, mix it, and apply the epoxy with a pin. The other advantage of this product is you don’t have to run to your partner for help separating your fingers after they’ve been glued together with other products. – Ray Skoff Issaquah, Wash. Thanks for writing, Roger. Here are some basic tips for searching FineScale.com: • On the home page, click on the “magnifying glass” icon at the right end of the black bar at the top of the page, 1. • Limit your search to one or two key words. Do not type a full question as you might in Google. • If all you want is Reader Gallery, there is a box you can check at the top of the search results, 2. • To the right of the search box is the “Filter” button, 3. Use it to narrow your search to relevant articles, videos, wallpapers, kit reviews, what have you. Select as many as you want and click “Update View,” 4. • If you no longer wish to see a specific filter, click the “x” in that filter’s box to make it go away. • A “padlock” icon next to a search result means you must be a subscriber to see it, 5. • Many entries will have tagged keywords listed next to “More About” or “Related Topics,” 6. Click on one to see related items. • If you still can’t find what you need, email questions@FineScale.com. If we don’t know the answer, we’ll find someone who does! my browser’s preferences and that fixed the problem — and it’s still a great site! the one-piece engine deck molded with the fenders. The kit provides PE or plastic options for some details, like the straps and engine screens. The most frustrating and time-consuming aspects of the build were the handrails and tracks. I had a hard time removing the thin grab rails from the sprue — they are connected in 10 spots. If I got them off the tree neatly, the brittle plastic seemed to almost crumble during cleanup. If I build another, I’ll replace the rails with brass rod or stretched sprue. The brittle plastic proved problematic for the click-together tracks, too. The links fit snugly, and it was hard to snap them together without breaking the pins. is given. Beautifully printed decals provide markings for two colorful Mustangs flown by World War II aces: American Beauty, of the 308th Fighter Squadron and Short-Fuse Sallee, of the 356th Fighter Squadron. Aided by the push-fit engineering, construction breaks down into subassemblies. The detailed cockpit comprises 19 parts and looks convincing with careful painting. Generally, parts fit is good. But I had to exert substantial pressure to properly seat each component. If you do dry runs like I do, it may be difficult to pry pieces apart without damaging them. The fuselage halves merge with separate upper and lower cowl covers, dorsal spine, tail-wheel section, and ventral radiator intake and exit. All of these parts meet along panel lines, and cleanup is limited to just the vertical fin area — nice! None of the fuselage seams required filler. The wing’s three major components join separate flaps, ailerons, and wheel wells. Meng’s Mustang is the first 1/48 scale kit to accurately portray the design of the gear bay with the rear wall being the main spar. Assembly of the wings went smoothly except for the leading-edge insert with the machine gun muzzles. I could not press them properly into place and needed to fill the interior structure. After that, the part was slightly recessed on top and needed filler underneath. he North American P-51 Mustang found its way into the air forces of many other countries during and after World War II — including, albeit through capture, not export, the Chinese communist People’s Liberation Army Air Force (PLAAF), which was founded in Beijing with two PT-19s, two Mosquitos, and six P-51Ds. HobbyBoss’ latest entry in its “Easy Assembly” line of 1/48 scale aircraft is a PLAAF P-51D kit. The same kit is also available boxed as a P-51D/Mustang IV in Royal Air Force and U.S. Army Air Force markings; another boxing is in Korean War U.S. Air Force and South African markings. Cleanly molded in neutral gray plastic, the kit’s pieces are few (43) as separate parts are minimized. Optional parts are limited to drop tanks. The main components have large alignment pins and locators, which facilitates a quick build of the fuselage and wings. The cockpit interior also is simplified, with no side-wall details given. The canopy and windscreen are molded as a single component. It is very clear, but there is a fine mold line running down its length. Kit: No. 7019 Scale: 1/144 Mfg. : Zvezda, www.zvezda.org.ru Price: $39.95 Comments: Injectionmolded, 111 parts, decals Pros: Great detail; innovative engine nacelle design; excellent fit; super decals Cons: Multipart gear a bit tedious to assemble; lower horizontal stab joints don’t follow panel lines; small stencil instructions. panel comes alive with some dry-brushing, but no decal is provided. Next came the nose, where I encountered problems. The clear canopy, C1, must be aligned with the fuselage sides as well as five other nose pieces while ensuring the firewall, instrument panel fit, and doors fit, too. When I reached this stage, the fuselage sides were too narrow and the canopy overlapped on both sides. I chose 5-minute epoxy and spread the fuselage halves gently while the epoxy set. I thought this worked (more in a moment). I assembled the nose, exhaust, prop, and horizontal stabilizers, leaving the skis for last, then started filling, sanding, and prepping for painting. Filler was needed along the spine and belly, the wing roots, and where the wings’ trailing edge mates with the fuselage. But during this step the nose fell apart. I had to clean up the parts, reassemble, and try again with more 5-minute epoxy. However, with all this trouble, the doors no longer fit and the model’s length comes up a few scale inches short. The decals, thin but not too delicate, went down well in a puddle of Pledge FloorCare Multi-Surface Finish. Join Admiraal Maarten Sweers of the Royal Netherlands Navy,Â as he leads his battlecruiser-carrier squadron against the might of Imperial Japan in Mark Klimaszewskiâ&#x20AC;&#x2122;s WW 2 novel FAR AFT AND FAINTLY. â&#x20AC;&#x153;Since 1969â&#x20AC;? "Your Spare Time is Our Business"
Closing Date: January 2018 closes October 9. FOR SALE ATLANTIS MAIL ORDER HOBBY SUPPLY Deep Discounts on Thousands of New kits, Discontinued and Closeout items. Send $2.95 to 9 Connor Lane Unit-G Deer Park, NY 11729 OR CALL 631-499-6733 M-F 11-4PM est. You can also visit www.atlantis-models.com to order the Catalog. ARMOR, AND MORE! FineScale Modeler’s 10-Year Collection: 2008-2017 DVD-ROM is the latest compilation of issues since the release of the 25-Year Collection DVD-ROM in 2007. Like the previous DVD-ROM, this new collection includes every cover, howto story, model kit review, photo, and special issue from the past 10 years — all reproduced in digital clarity. 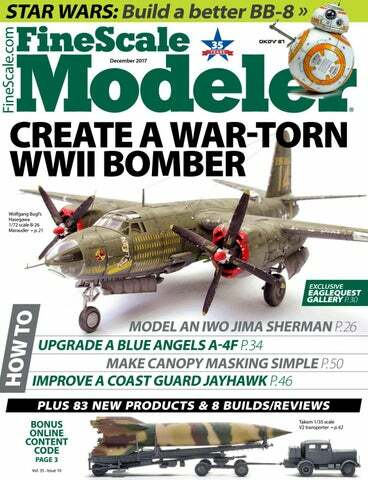 Enjoy access to more than 7,100 pages of FineScale Modeler on your laptop or desktop. Promotional offer available for a limited time. Free standard shipping to U.S. addresses only. Sales tax where applicable. This product requires a PC or Mac with a DVD-ROM drive and will not operate on tablet computers, standalone DVD players, media players, e-readers, or smartphones. PDFs on these DVDs are locked and information on them is non-transferable. FineScale Modeler’s 10-Year Collection 2008-2017 DVD-ROM will arrive in November 2017.